Our second release of the very best of AVV! This special bottling represents our history, tradition and excellence. To commemorate our history with Cabernet Sauvignon we selected our single best barrel of Cabernet Sauvignon from the 2013 vintage. Our fans across the country always refer to us as “AVV”, so they will easily recognize this ultra-premium wine by the logo on the front of this silk screened bottle. The 2013 growing season was almost identical to 2012. The year began with another dry winter and spring, then throughout the summer we experienced a warm growing season with abundant sunshine and even growing temperatures. Our grapes ripened evenly, harvest started early and proceeded at a fairly quick pace. While news of the lack of rain dominated conversations, there was an upside to the drought; the grapes had rich concentrated flavors. Each year we reserve the best lots of Cabernet Sauvignon for CYRUS and Alexander School Reserve wines. Winemaker Kevin Hall selected the very best barrel of 2013 Cabernet Sauvignon from those lots for this special wine. This barrel of wine was produced from a single thirty five year old vineyard with low yielding, gnarly, mature vines that produced loose clusters of pea sized grapes with one or two seeds. This led to great color extrac-tion and concentration without much bitterness. This wine showed tremendous structure and concentrated fruit along with complexity and balance. We aged the wine for 34 months in a single new French oak tight grain barrel to slowly release the complexities while allowing the wine to develop and soften. This deep purple hued wine has intense aromatics of black cherry, vanilla chocolate, eucalyptus and oak. Still young, the 2013 has big, ripe flavors of red and black cherry, licorice and red plum. Great acidity balances the concentration and long finish of this once in a lifetime selection. Each silk screened bottle is hand numbered and packed in a single wood box. This is a wine to lay down and savor on special occasions. 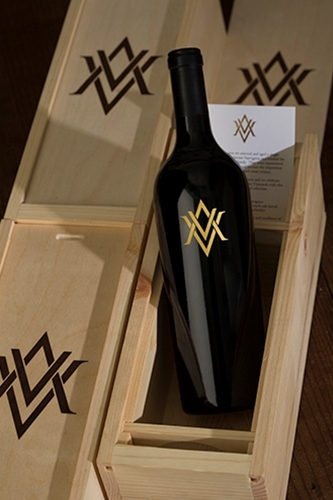 It showcases the very best of AVV and our rich history with Cabernet Sauvignon.